Welcome to the Butterfly Childrens Bedding section! Here you will find wonderful Butterfly Bedding Sets for Children in Twin and Full Queen sizes that will add life and personality to any room! 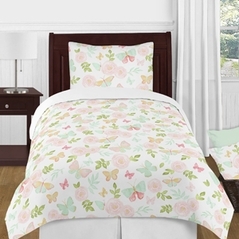 You will be able to find various Butterfly bedding sets in a variety of pink, purple and pastel colors. These beautiful creatures are not only adorable but help to teach our children about how we change as we go through different stages of our lives. From caterpillar to cocoon to beautiful butterfly, these creatures are magical in the eyes of our children. So, if you've already viewed our Modern Bedding for Children and our stylish Safari Childrens Bedding Sets but want something a little different then you've come to the right section. With bright pastel colors like pink and purple, pink and orange, and pink and green, you'll be hard pressed to find a more stylish bedding set. All of our quality butterfly linens and room decor accessories coupled with our collection of butterfly bedding sets will be sure to turn any child's room into a fun adventure. And from cute butterfly hanging wall accessories to matching butterfly lamp shades, we are the one-stop-shop for all your needs. Because here at Beyond Bedding you are sure to find the best values from the leading childrens bedding manufacturers such as Sweet Jojo Designs where quality is never sacrificed.